The Agilent 34970A is a powerful data acquisition/switch unit that is designed for the challenging testing needs of today’s technicians. Well known in the industry for its capabilities with small and medium applications, it excels both in the field and on the test bench. Its 3-slot mainframe comprises of built-in DMM, control plug-in modules and an optional switch. 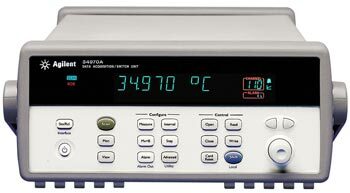 The 34970A is capable of measuring and converting 11 separate input signals. They include temperature with thermistors, RTDs, and thermocouples; dc/ac volts; 4- and 2-wire resistance; period and frequency; and dc/ac current. 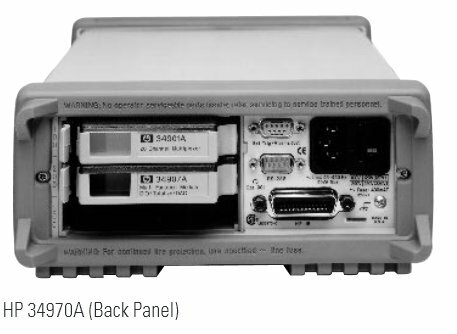 The GPIB and RS-232 standard interfaces allow users to quickly connect the unit to either a PC or laptop. The data acquisition/switch unit also features BenchLink Data-Logger Software that is used in configuring and controlling tests, displaying results, and collecting data for analysis. It assists with numerous applications in test configurations, data analysis, and real-time data display. The 34970A offers powerful measurement performance, connectivity options, and flexibility. Its built-in signal conditioning, modular flexibility, and compact design make this data acquisition/switch unit a popular choice for various data acquisition applications. It offers 22 bits resolution, ultra-low reading noise, and 0.004% dcV accuracy. Combining these features with a 250 channels/sec scan rate yields speed and accuracy. It also allows technicians to measure resistance, temperature, ac/dc volts, current and frequency with precision and speed. Its internal auto ranging DMM allows to directly measure 11 separate functions, and its unique design enhances per channel configurability. The three module design and the eight switch/control modules make it possible for users to customize the device to meet most any specific test needs. As the requirements expand, users are able add more modules The intuitive front panel of the 34970A is specially designed to allow operators to use the device with little training and it includes self-guiding menus. In addition, with its monitor display mode, you can easily check the progress of the tests being carried out. The 34970A also features a non volatile memory that stores data when either connected to or on battery power. It is easy to obtain user-defined units from raw inputs using the scaling function feature of the 34970A. In addition, the unit also features a real-time clock that is used for time stamping readings and pacing scans. Combining these features yields an impressive measurement performance. Its powerful feature set is excellent for both testing and troubleshooting a wide range of systems. Users can also obtain a powerful data logger by configuring the 34970A with a relay multiplexer. It can be employed for a multitude of monitoring and data logging applications. Its modular design makes it a scalable test solution that allows users to add analog output channels, digital I/O, and an actuator. The resolution, accuracy, and speed offered by this data acquisition/switch unit make it an excellent automated test system. Contact us for more information and availability of the Agilent 34970A and other refurbished or new Agilent models. This entry was posted in Site News and tagged Agilent 34970A. Bookmark the permalink.